For Spay and Neuter Assistance Click HERE! Why it’s important to spay and/or neuter your pet? The #1 Reason to Spay and Neuter your animals is it saves lives! 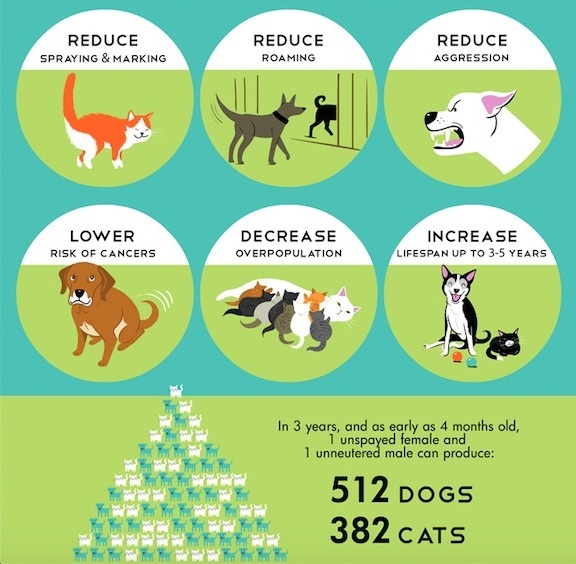 Spaying and Neutering prevents litters, which reduces pet overpopulation. It decreases the number of unwanted and homeless animals. Rescue groups and shelters are not overburdened and euthanasia rates go down. There are numerous health benefits and no negative ones! A female cat or dog should have at least one litter for health reasons. This is medically and factually incorrect. In fact, there are medical benefits if you have your dog spayed before her first heat. Spaying or Neutering will make my cat or dog fat and lazy. Too much food and not enough exercise will make him/her fat and lazy. Fixing my pet will change its personality or make him less protective. If anything, it will make him calmer and more focused on you. We always find homes for our kittens/puppies. Really? Do you know where they are? What about your kitten’s kittens? What about your puppies’ puppies? My dog or cat is so cute and unique there should be more of her; my dog is a purebred. Shelters are full of cute and unique cats and dogs. Over 50% of dogs in shelters are purebreds. Responsible breeders selectively breed for good genetics, health, and temperament. They will always take one of their dogs back. Would you? Chico’s animal shelter receives 49 animals for every 1000 people -it may not seem like much, but the national average is 30 animals for every 1000 people. Many of them are unwanted and need a new home. Irresponsible breeding is one of several reasons why Chico has an overpopulation problem – backyard breeders produce too many unwanted animals and often they are breeds that can be commonly found in shelters already. By law, our City shelter must hold stray animals for at least 5 days. The City of Chico must pay for this 5-day holding period, which means tax payers are directly affected by animal overpopulation. The overpopulation of cats in Bidwell Park have an effect on the bird population and other wildlife in the park.